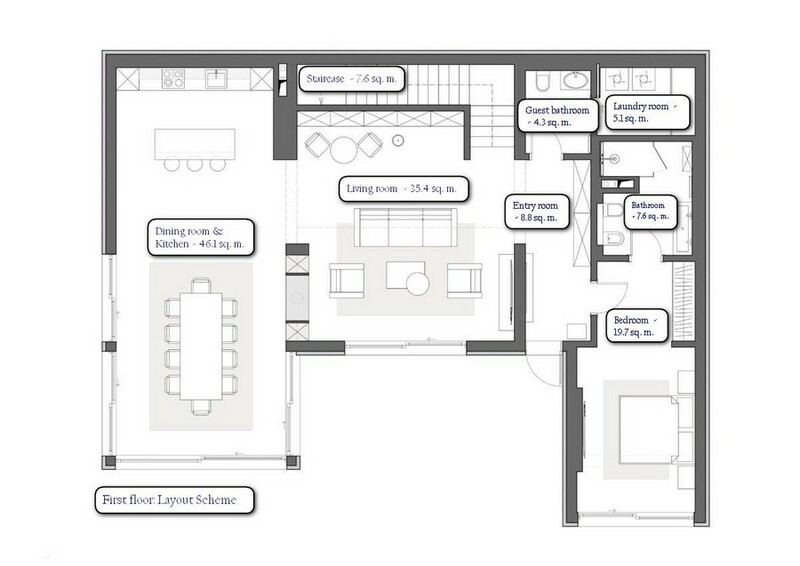 230 square meters is not a big area for a villa. 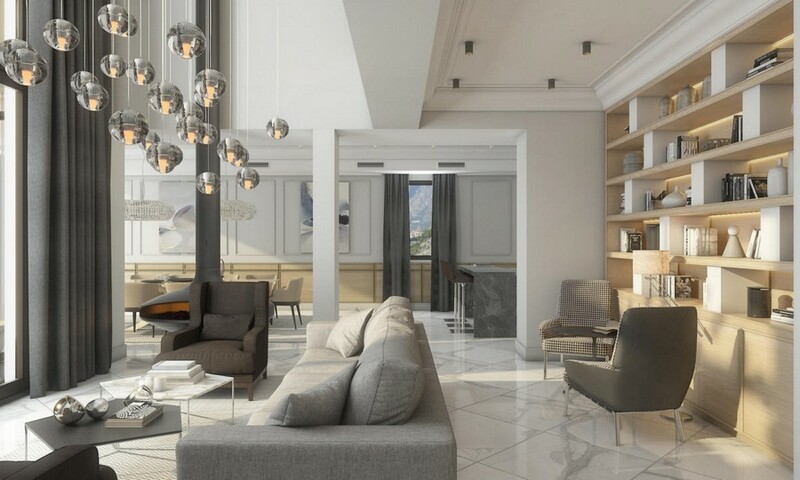 Especially considering that it has to include 7 rooms, 4 bathrooms, a big kitchen and thereby preserve the sense of spaciousness and openness in its interiors. 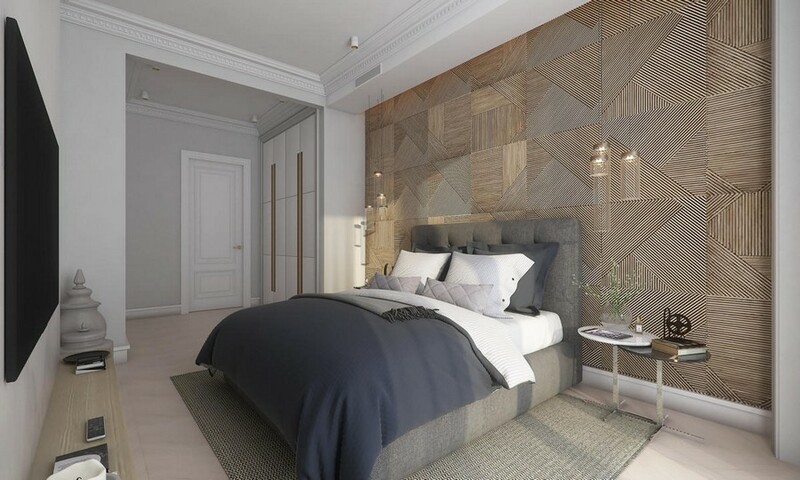 Balanced symmetrical layout, spacious rooms without any extra furniture, contemporary and pretty neutral style concept – obviously, the designer managed to handle the issue. The most complicated part of the project was the layout. The main limitation was a few load-bearing columns on both floors, which pre-determined the future layout to a great extent. Two more challenges were well-thought-out design of storage zones and common relaxation areas, which had to be full-fledged and not overloading the space with too much furnishing at the same time. 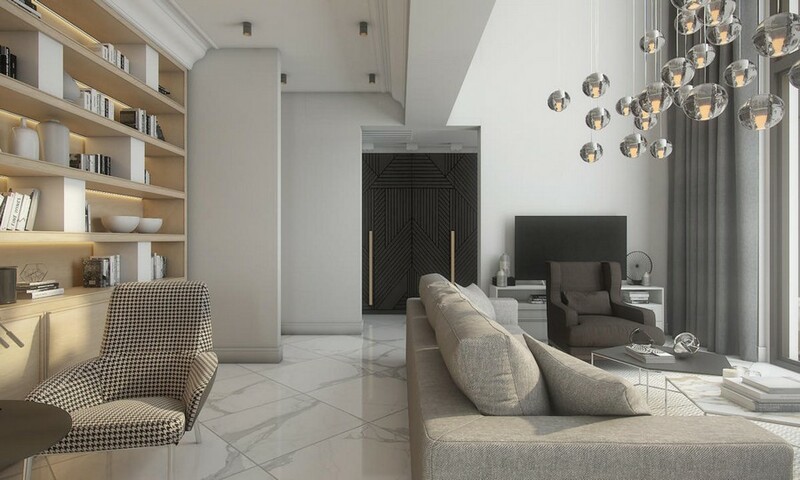 In the end the first floor was designed as a big open-concept space including a kitchen, a dining room and a lounge with a zoning piece – a hanging fireplace. Also in one of the villa’s wings arranged was one of the bedrooms with a bathroom exit, a small guest bathroom and a laundry. 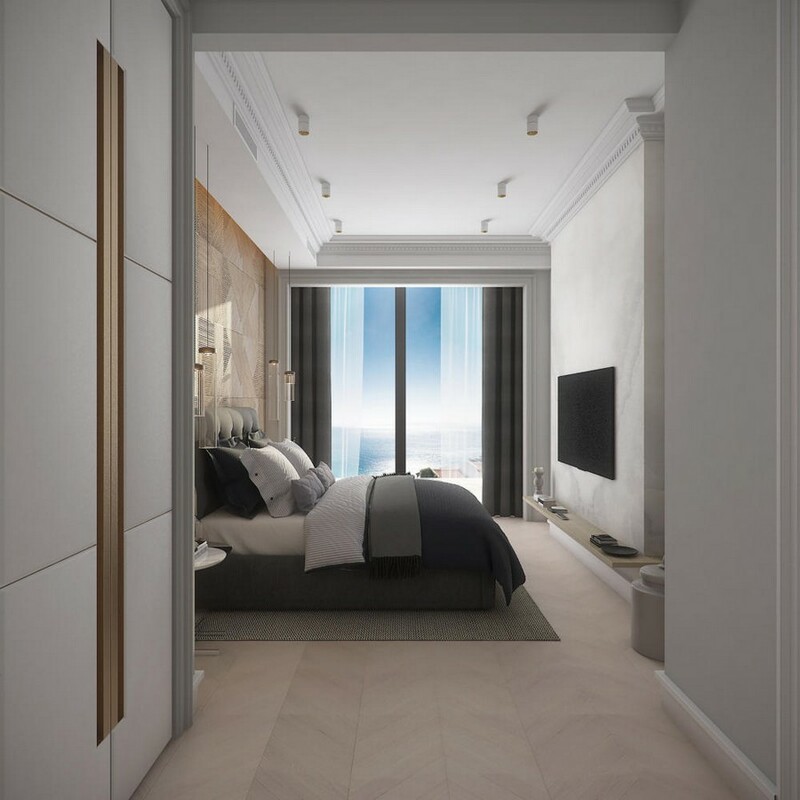 While the second floor starts from a gallery leading to private spaces – three bedrooms, a walk-in closet and two bathrooms. 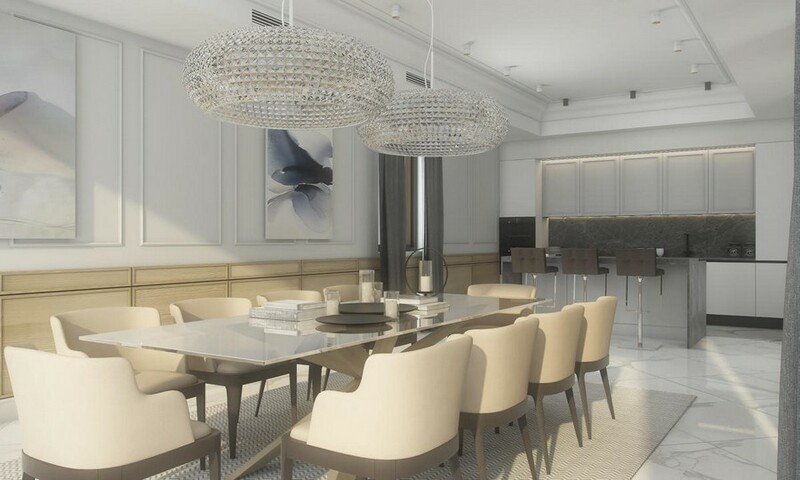 As regards bringing all of these many rooms together in terms of style concept, it was determined to implement this through neutral color scheme and similar finishing materials. 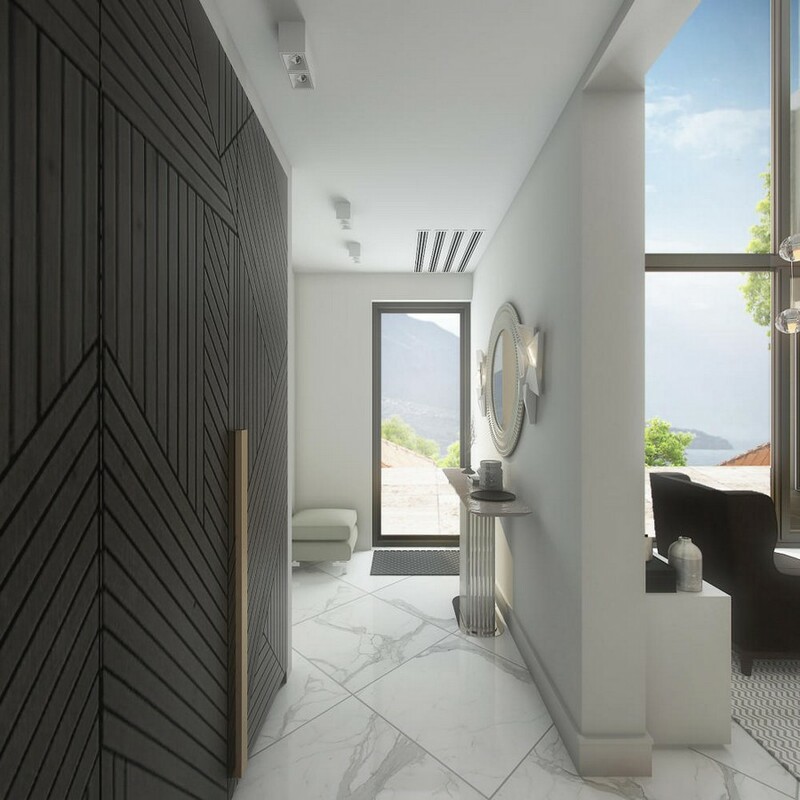 In particular used was grayish white paint by Little Greene, light wood moldings and wall panels, wooden doors by Lualdi Porte, mosaic parquet flooring by Coswik, and marble of Calacatta and Luciano Marron brands in the bathrooms. Quiet color range was also chosen for home textile by New Pottery Barn. Such an interior undoubtedly required well-designed lighting. Here the key role is played by huge panoramic windows letting much sunlight in. As for artificial light, it’s represented by numerous laid-on and built-in lamps, which create the so-called architectural light and accent some interior details. And in the lounge and dining room envisaged are also chandeliers for creating a cozy feel in definite zones. The entire wing of the first floor is occupied by the kitchen and dining room. The role of its centerpiece is played by a glass Spider table of Cattelan Italia brand. It’s surrounded by comfy chairs and bar stools in dark chocolate brown leather of the same manufacturer. 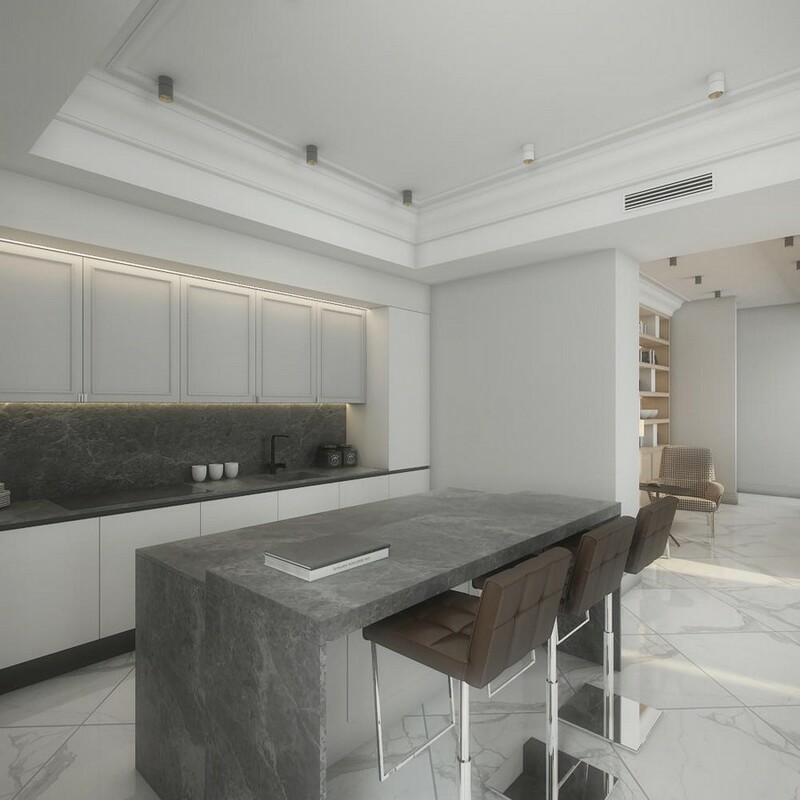 A laconic kitchen set is bespoke and combines light minimalist cabinetry with dark gray marble backsplash and countertops. By the way, upper cabinets finish replicates the pattern of wall panels in the dining zone, linking these two functional areas together. The bridge between the two wings of the villa is the lounge. 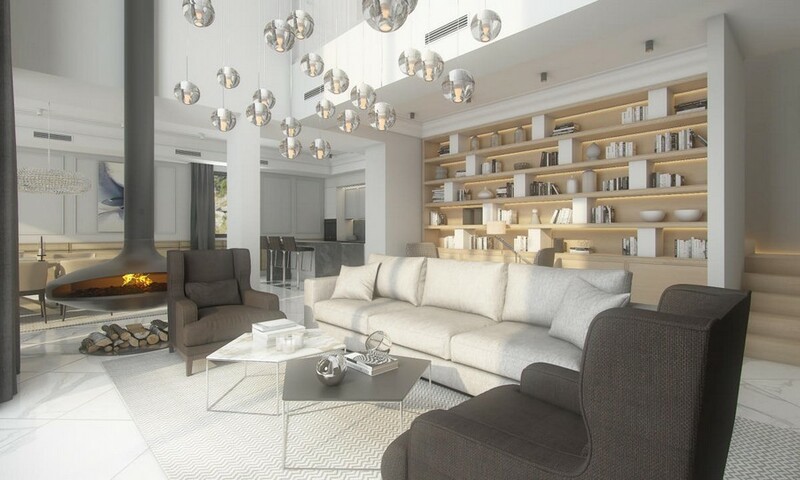 For this room the designer picked a beige textured sofa by Minotti and a couple of brown chairs by Porada. One of the walls is occupied by a large shelving unit with two cozy black-and-white arm-chairs by Minotti dressed up with a crow’s feet pattern. A classical white TV stand is custom-made. 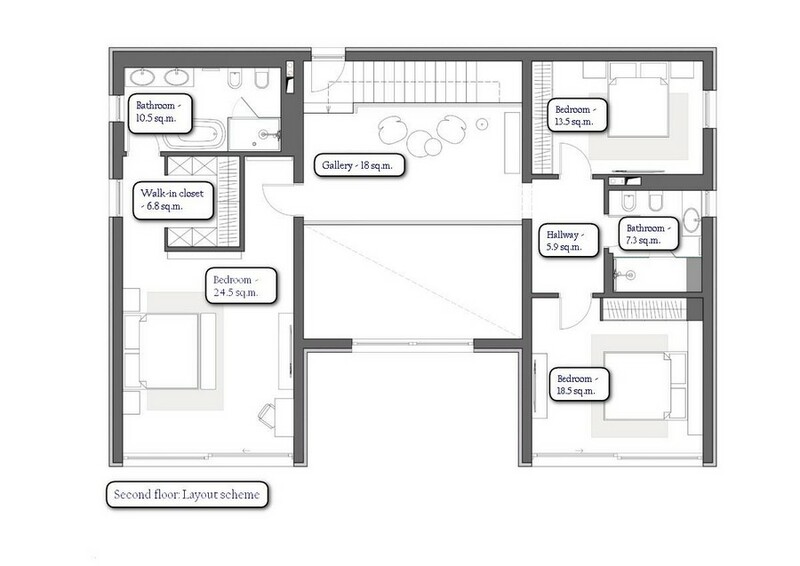 As you remember, one of the bedrooms is located on the first floor. 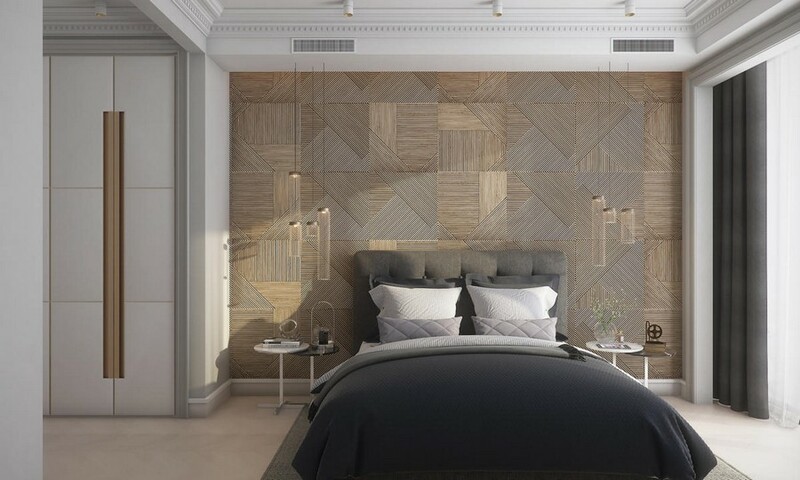 Its “lead characters” are a bed with tall headboard by Calligaris and light wood wall décor by Emme Mobili. This bedroom has a bathroom exit. 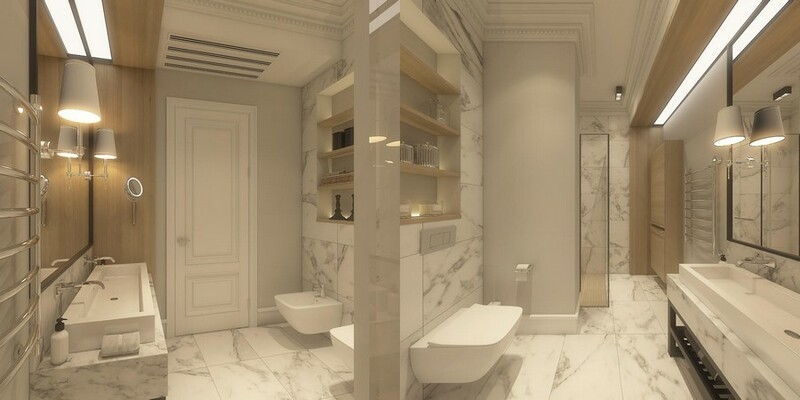 The latter is equipped with a suspended toilet bowl and bidet by Villeroy & Boch (Vinticello collection), a bespoke wash basin cabinet with metal framework and white marble countertop, a custom-made closet in light wood, and a vessel sink by Kerasan with a wall-mounted mixer by Hansgrohe. And in concluding our tour around the first floor, let’s have a look at the guest bathroom. 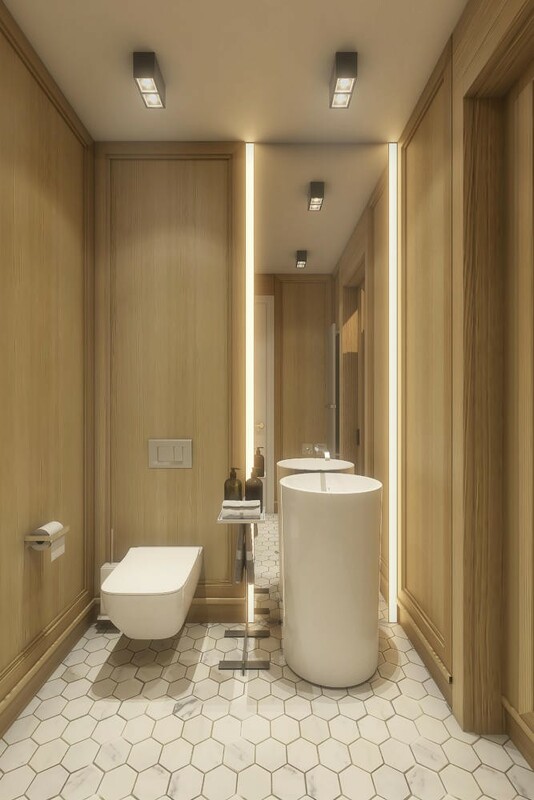 It’s pretty small, with walls faced with natural oak panels and equipped with sanitary porcelain and fixtures by Hansgrohe and Villeroy & Boch.